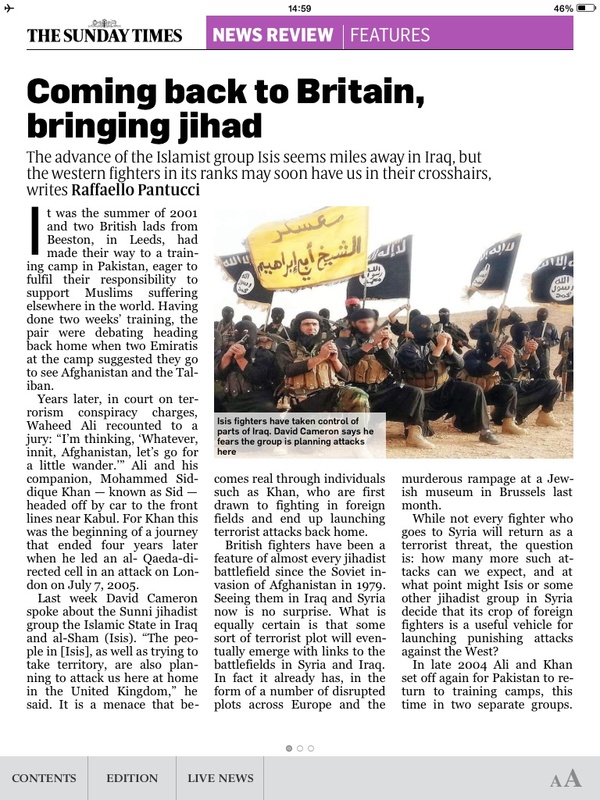 I had a piece in the weekend’s Sunday Times News Review section looking at the phenomenon of Brits going to foreign battlefields and coming back posing a terrorist threat. For some reason, it only shows up in their e-version of the newspaper and on the iPad version, but not online more generally. Anyway, they have allowed me to republish it here, so thank you to the editors for that. Beyond this, I spoke to the Telegraph about this topic and the recent ISIS video to surface with Brits in it, about some Brits linked to al Muhajiroun who jumped bail and seem to have surfaced in Syria for the BBC, to Channel 4, NBC and Voice of America about ISIS and Iraq. On the other side of the equation, I spoke to Caixin about China in Afghanistan and South China Morning Post about Xinjiang. It was the summer of 2001 and two British lads from Beeston, in Leeds, had made their way to a training camp in Pakistan, eager to fulfil their responsibility to support Muslims suffering elsewhere in the world. Having done two weeks’ training, the pair were debating heading back home when two Emiratis at the camp suggested they go to see Afghanistan and the Taliban. Years later, in court on terrorism conspiracy charges, Waheed Ali recounted to a jury: “I’m thinking, ‘Whatever, innit, Afghanistan, let’s go for a little wander.’” Ali and his companion, Mohammed Siddique Khan — known as Sid — headed off by car to the front lines near Kabul. For Khan this was the beginning of a journey that ended four years later when he led an al Qaeda-directed cell in an attack on London on July 7, 2005. Last week David Cameron spoke about the Sunni jihadist group the Islamic State in Iraq and al-Sham (Isis). “The people in [Isis], as well as trying to take territory, are also planning to attack us here at home in the United Kingdom,” he said. It is a menace that becomes real through individuals such as Khan, who are first drawn to fighting in foreign fields and end up launching terrorist attacks back home. British fighters have been a feature of almost every jihadist battlefield since the Soviet invasion of Afghanistan in 1979. Seeing them in Iraq and Syria now is no surprise. What is equally certain is that some sort of terrorist plot will eventually emerge with links to the battlefields in Syria and Iraq. In fact it already has, in the form of a number of disrupted plots across Europe and the murderous rampage at a Jewish museum in Brussels last month. While not every fighter who goes to Syria will return as a terrorist threat, the question is: how many more such attacks can we expect, and at what point might Isis or some other jihadist group in Syria decide that its crop of foreign fighters is a useful vehicle for launching punishing attacks against the West? Arriving in Pakistan ahead of Ali, Khan and Tanweer told the British al-Qaeda connection they met there that they had come to train and ultimately go to Afghanistan “to fight against the Americans”. After a few days they were introduced to “Haji”, a senior al-Qaeda figure who, according to a report by their British al-Qaeda guide, “convinced the brothers [Khan and Tanweer] to return and do a martyrdom operation in UK”. By the time Ali arrived at the Pakistani training camp, his friends’ behaviour had changed, and within a few weeks they announced to him that they had to go back to “do something for the brothers”. 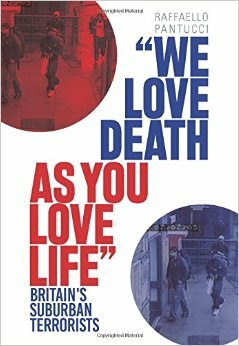 This proved to be the 7/7 bomb­ings in London, part of a chain of plots directed by al-Qaeda against the UK that used the pipeline of zealous young British men who had originally sought to fight in Afghanistan as weapons against the West. Almost two years to the day after the 7/7 attacks, a pair of car bombs failed to go off in Haymarket, central London, saving unknown numbers of revellers at the Tiger Tiger nightclub. The next day Bilal Abdullah and Kafeel Ahmed attempted to drive a car bomb into Glasgow International airport’s main terminal. Fortunately for travellers, the attackers failed to get inside the building, and their bomb detonated outside, fatally wounding Ahmed and injuring Abdullah. Security officials believe that in 2006, on a trip to visit his family’s home in Iraq, Abdullah had linked up with elements connected to the anti-US insurgency. If the letter is to be believed, it was the Islamic State of Iraq, the precursor to Isis. What he did with the group is unclear, though the similarity of his device to bombs that were often going off in Iraq suggests he may have developed some ideas while there. Certainly, on the stand at his trial Abdullah spoke of his anger over British foreign policy towards his mother country, but it was not clear that he had received any direction in launching his attack with Ahmed. Instead, online conversations between the two show them joking about “starting experiments” and discussing how to build detonators. Plots by foreign fighters have also emerged from places where the link between the home country and the battlefield is harder to establish. Mohammed Muhidin Gelle was a Somali Dane who was drawn to the Somali terrorist group al-Shabaab and was picked up by the Kenyan authorities in 2009 as part of a cell plotting attacks during a visit to Nairobi by Hillary Clinton, then the US secretary of state. He was repatriated to Denmark but did not renounce his extremist ideas and later attempted to murder with an axe the cartoonist Kurt Westergaard, who had created an image that he accused of mocking the prophet Muhammad. Al-Shabaab acknowledged it knew Gelle and praised him, saying “we appreciate the incident in which a Muslim Somali boy attacked the devil who abused our prophet”, but failed to claim Gelle’s act. Track forward to today and authorities in Europe have already seen a number of worrying plots linked to Syria. Earlier this year French authorities arrested a man identified as Ibrahim B who had spoken in online communications of wanting to “punish France”. At his rented accommodation they found drink cans fashioned into nail bombs with about 2lb of triacetone triperoxide, or TATP — an explosive linked to the 7/7 bombings. Part of a network of extremists in France that was connected to an attack on a Jewish grocer’s in Paris in 2012, Ibrahim B had fled a crackdown on the network and gone with two friends to Syria, where they had fought alongside Jabhat al-Nusra, al-Qaeda’s representative group in the country. The full details of what the alleged attacker at the Jewish museum, Mehdi Nemmouche, was doing are unclear, but when he was arrested, a machine­gun was found in his possession wrapped in an Isis flag. Soon after his arrest a French Isis fighter in Syria tweeted that Nemmouche had fought with Isis using the name Abu Omar al-Firansi. The tweet was rapidly deleted. The question that remains un­answered is whether the “youths of Islam” he was referring to are European fighters — and whether some of them have already been sent back to carry out his deadly threat.